The Atocha Train Station In Spain's Capital City, Madrid. 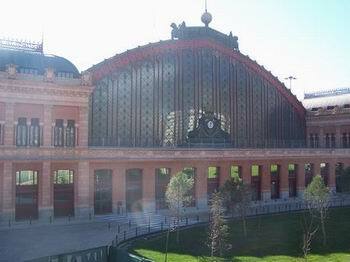 Atocha railway station, the first train station in Madrid, was inaugurated on Monday, February 9th, 1851. At that time it was named Estación de Mediodía, which is now an area within the district of Arganzuela, just south of Parque del Retiro. Today the railway station is simply called, Estación de Atocha. Atocha is the biggest train station in Madrid. It is the main railway station for commuter trains for the city. It is also the focal point for intercity trains from all over Spain, as well as the country's main station for the high-speed AVE trains. The AVE trains connect different regions, such as Catalonia and Andalusia. Eventually they hope to connect every region of Spain. Renfe, the Spanish national railway company, run the AVE trains. Many travellers will arrive at this railway station from other cities in Spain, and since the location is practically the centre of Madrid, there are plenty of accommodation options for visitors looking for nearby, convenient lodging. The following link will show you hotels, hostals or apartments within 1 to 2 kilometres of Atocha. The original Atocha train station building was mostly destroyed by fire in the early 1890s. Alberto de Palacio Elissagne was the architect responsible for the old building's new design, which incorporated a style that was predominantly of wrought iron. Gustave Eiffel, better known for the tower bearing his name in Paris, also collaborated on the project. The renewed old building was re-opened for service in 1892. It was in constant use for exactly 100 years when in 1992 it effectively became a shopping mall with the addition of a nightclub and various cafés. Some 4,000 square metres of the centre of the old building also houses a beautiful tropical garden. Rafael Moneo was the man responsible for the design of the new Atocha train station terminal building. The design was largely centred around the new high-speed AVE trains that travel to places like Seville and Barcelona. New routes for the AVE trains are in planning and will come online in due course, eventually connecting the entire country. Atocha train station is located at the Plaza del Emperador Carlos V. Two of the Madrid Metro stations, Atocha Renfe, which is actually part of the main railway station, and Atocha nearby, connect to Estación de Atocha. Major Madrid attractions, such as the Reina Sofía museum, the magnificent Real Jardin Botanico, and Parque del Retiro, lie within easy walking distance. There are also a large number of excellent hotels in the nearby vicinity. On the morning of March 11th, 2004, a day now known in Spain as 11-M, 191 people were killed and 1,755 were wounded in a series of bombings that occurred in four cercanías, or commuter trains, both in the station and close by the station. The victims, while mainly from Spain, came from no less than 17 different countries. The Basque terrorist group ETA were blamed initially, but the official investigation concluded that the attack was by Islamist extremists. Madrid's Atocha train station is more reminiscent of a modern airport than of the traditional idea of a railway station. The airport analogy carries over with signed references of "Train Departures" and "Boarding Lounges." Currently, around 16 million passengers per year pass through here. The current extension work will separate the station into two terminals for Arrivals and Departures, like an airport, and in fact when inaugurating the first phase of this work, the Minister for Public Works, José Blanco, called it the "nuevo Barajas", Barajas being Madrid's airport. Madrid Atocha is spacious with a light, airy feel, the information counters have English-speaking attendants, and most of the signs are in dual languages, Spanish and English. Tickets for trains leaving from this station may be purchased online from RENFE.